The awakening of Kundalini and its union with Shiva is immediately and intimately connected with the whole brain. To explain it simply, we can say the brain has ten compartments, and of these, nine are dormant and one is active. Whatever you know, whatever you think or do is coming from one-tenth of the brain. The other nine-tenths, which are in the frontal portion of the brain, are known as the inactive or sleeping brain. Why are these compartments inactive? Because there is no energy. The active portion of the brain functions on the energies of ida and pingala, but the other nine-tenths have only pingala. Pingala is life and ida is consciousness. If a man is living but is unable to think we say he has prana shakti but not manas shakti. Similarly, the silent parts of the brain have prana, not consciousness. So a very difficult question arises: how to awaken the sleeping compartments of the brain? We know how to awaken fear, anxiety and passion, but most of us do not know how to awaken these dormant areas of the brain. In order to arouse the silent areas, we must charge the frontal brain with sufficient prana, with sufficient vital energy and consciousness, and so we must awaken sushumna nadi. For both these purposes we must practice pranayama regularly and consistently over a long period of time. In Kundalini yoga it was discovered that the different parts of the brain are connected with the chakras. Certain areas are connected with mooladhara chakra, others with swadhisthana, manipura, and so on. When you want to turn on a electric lamp, you don't have to touch the lamp itself, you operate it by means of the switch on the wall. Likewise, when you want to awaken the brain, you can't deal with it directly, you have to flick the switches which are located in the chakras. Modern science divides the dormant area of the brain into ten parts, whereas in kundalini yoga we divide it into six. The qualities or manifestations of the brain are also six fold, e.g. the psychic powers, These manifest in different individuals according to the degree of awakening in the corresponding areas of the brain. Everybody is not clairvoyant or telepathic; some people are talented musicians. Anybody can sing, but there is a center in the brain where transcendental music expresses itself. A genius is one who has awakened one or more of the dormant areas of the brain. People who have flashes of genius are those who have had a momentary awakening in certain circuits of the brain. It is not total awakening. When the total brain wakes up, you become a junior god, an incarnation or embodiment of divinity. There are various types of geniuses; child prodigies, inspired poets, musicians, inventors, prophets etc. In these people a partial awakening has occurred. Although the classical descriptions place heavy emphasis on the awakening of kundalini in mooladhara chakra, there is widespread misconception that kundalini must be awakened there and made to travel through and awaken all the chakras in turn. In fact, the seat of Kundalini is actually sahasrara. Mooladhara is only a manipulation center or switch, like the other chakras, but it happens to be easier for most people to operate this switch. Each of the chakras is independent; they are not connected with each other. This means, if kundalini shakti awakens in mooladhara, it goes directly to sahasrara, to a particular center in the brain. Similarly, from swadhisthana the shakti passes directly to sahasrara, from manipura it goes straight to sahasrara and so on. Kundalini can be awakened in an individual chakra or it can awaken throughout the whole network of chakras collectively. From each chakra, the awakening shock moves up to the top of sahasrara. However, the awakening is not sustained and those centers in the brain return to dormancy. This is what is meant by the return of kundalini to mooladhara. If kundalini awakens in an individual chakra, the experiences which are characteristic of that chakra will be brought into conciousness. This may also occur when one does the practices for an individual chakra. 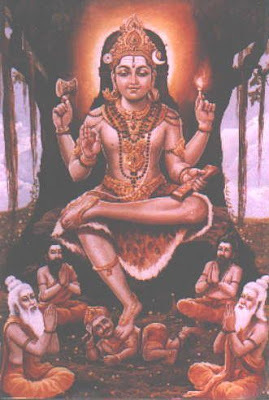 For example, swadhisthana practices will raise joy; manipura practices will increase the self-assertion; anahata stimulation will expand the love; the vishuddi practices will awaken discrimination and wisdom, and ajna practices will increase the flow of intuition, knowledge and perhaps extrasensory abilities and so on. If the nervous system is highly aroused, we may have other faculties opening because of the general arousal of the brain. This probably results from stimulation of an area in the lower end of the brain called the reticular formation. The function of this areas is to rouse the whole brain or to relax it, as in sleep. The reticular formation and related areas have an inherent rhythm which is responsible for our sleeping/waking cycles. but it is also largely activated by sensations from outside-by light ,sound, touch, etc., and from inside via the autonomic nervous system. It is the latter which seems to account for the more general arousal caused by the kundalini practices and other powerful yoga practices such as kumbhaka or breath retention. Kundalini -Energy or nerve messages? There are a number of schools of thought as to what kundalini really is. Many yogis say that kundalini is a flow of pranic energy along in esoteric pathway (sushumna) associated with the spinal axis. They consider that it is part of the flow of prana within the meshwork of the pranic body and that there is no anatomical counterpart. Other yogis relate their perceptions of kundalini to the flow of messages along the nerve fibers. These arise in the networks of the autonomic plexuses and ascend along tracts in the spinal cord to definite anatomical centers in the brain. These schools of thought use different descriptions to convey the experience of kundalini, but they all agree that the experience of kundalini is a total psycho physiological event which centers around the spinal cord. Within the spinal cord there is a very important fluid, the cerebrospinal fluid. When, through practices such as pranayama, awakening occurs in mooladhara chakra, this fluid gets excited. We cannot really say what happens to it because even the scientists are not exactly sure, but by studying the experiences of kundalini awakening, one thing is apparent. When the cerebrospinal fluid moves through the vertebral column, it alters the phases of consciousness and this is a very important process as far as evolution is concerned. It is the chitta or consciousness which undergoes evolution in man. Chitta does not have a location point in the body, it is psychological in nature, but it is controlled by the information supplied by the indriyas or senses. While chitta is being constantly supplied with information, its evolution is blocked, but if you prevent the passage of information from the indriyas, chitta will evolve very quickly. That is to say, if you isolate chitta from the information being relayed through the eyes, nose, ears, skin and tongue, chitta is then compelled to experience independence. When the cerebrospinal fluid is affected during pranayama, the senses become dull and their messages are relayed to chitta very slowly. Sometimes, when tire cerebrospinal fluid is highly stimulated, all sensory impulses are suspended and experiences take place within the chitta. Sometimes these experiences are fantastic, you might see light, feel the whole earth trembling or experience your body as if it were as light as a piece of cotton. These and others are the experiences of a chitta as a consequence of the cerebrospinal fluid's reactions. One world renowned scientist, the late Itzhak Bentov, put forward the theory that kundalini is an effect caused by the rotation of nerve impulses around the cortex of the brain during meditation. He considered that this is caused by rhythmical pressure waves which result from the interaction of the heart beat, breathing, and the fluid inside the skull, thereby causing the brain to oscillate up and down which stimulates specific nerve currents in the brain. Although there are varying views about kundalini, one thing is certain— kundalini has the ability to activate the human consciousness in such a way that the person can develop his most beneficial qualities, can enter a much more intimate relationship with nature about him, and can become aware of his oneness with the whole cosmos. All the great miracles of the remote and recent past. and the ones yet to come, have sprung from what is known as the storehouse of cosmic consciousness, the golden egg, the golden womb, the hidden hiranyagarbha within the structure of the human brain. This particular center in us is not sleeping or inactive, but it is unconscious, only because we are not conscious of it. What came as revelation to the ancient rishis, to Newton and Einstein and to many other great seers, is existing in us also, but it came to their Conscious plane while it does not come to ours. This is the only difference between the inspired artist and the common man. The aim of kundalini yoga is not really to awaken the power of man, but rather to bring the power down to earth or to bring the power of the unconscious or higher consciousness, to normal consciousness. We have no need to awaken the consciousness, for it is ever awake. We have only to gain complete control over our higher Conscious forces. By means of kundalini yoga we just try to bring the centers from mooladhara to ajna into operation so that the higher knowledge will be gradually revealed to us. Today, man has mastered the material dimension, the energy of prakriti and discovered the mysteries of nature. Now, through the process of kundalini, man should become master of the spiritual dimension.